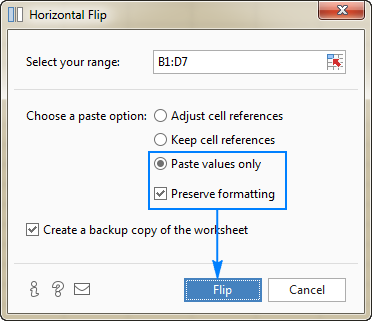 The tutorial shows a few quick ways to flip tables in Excel vertically and horizontally preserving the original formatting and formulas. 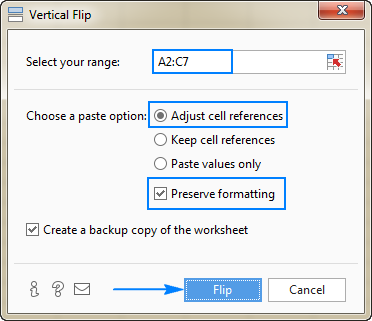 Flipping data in Excel sounds like a trivial one-click task, but surprisingly there is no such built-in option. 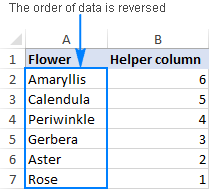 In situations when you need to reverse the data order in a column arranged alphabetically or from smallest to largest, you can obviously use the Excel Sort feature. But how do you flip a column with unsorted data? Or, how do you reverse the order of data in a table horizontally in rows? You will get all answers in a moment. 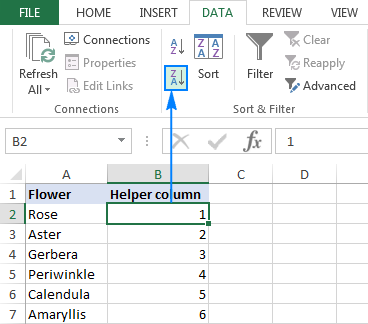 With just a little creativity, you can work out a handful of different ways to flip a column in Excel: by using inbuilt features, formulas, VBA or special tools. The detailed steps on each method follow below. Add a helper column next to the column you want to flip and populate that column with a sequence of numbers, starting with 1. This tip shows how to have it done automatically. Sort the column of numbers in descending order. For this, select any cell in the helper column, go to the Data tab > Sort & Filter group, and click the Sort Largest to Smallest button (ZA). Now you can safely delete the helper column since you do not need it any longer. Type 1 into the first cell and 2 into the second cell (cells B2 and B3 in the screenshot below). Select the cells where you've just entered the numbers and double-click the lower right corner of the selection. That's it! Excel will autofill the column with serial numbers up to the last cell with data in the adjacent column. Sometimes (most often when you select the whole column of numbers prior to sorting) Excel might display the Sort Warning dialog. In this case, check the Expand the selection option, and then click the Sort button. Tip. If you'd like to rotate data from rows to columns or vice versa, use the Excel Transpose feature or other ways to convert rows to columns demonstrated in How to transpose in Excel. At the heart of the formula is the INDEX(array, row_num, [column_num]) function, which returns the value of an element in array based on the row and/or column numbers you specify. In the array, you feed the entire list you want to flip (A2:A7 in this example). 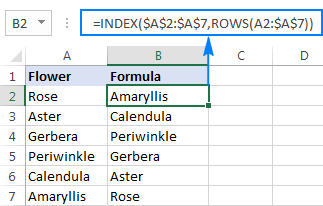 For the first cell (B2), ROWS(A2:$A$7) returns 6, so INDEX gets the last item in the list (the 6th item). In the second cell (B3), the relative reference A2 changes to A3, consequently ROWS(A3:$A$7) returns 5, forcing INDEX to fetch the second to last item. In other words, ROWS creates a kind of decrementing counter for INDEX so that it moves from the last item toward the first item. Now that you have two columns of data, you may want to replace formulas with calculated values, and then delete an extra column. 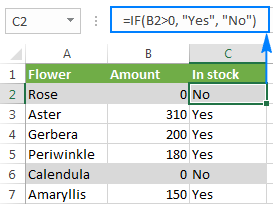 For this, copy the formula cells, select the cells where you'd like to paste the values, and press Shift+F10 then V, which is the fastest way to apply Excel's Paste Special > Values option. For more information, please see How to replace formulas with values in Excel. xTitleId = "Flip columns vertically"
Open the Microsoft Visual Basic for Applications window (Alt + F11). Click Insert > Module, and paste the above code in the Module window. You select one or more columns using the mouse, not including the column headers, click OK and get the result in a moment. To save the macro, be sure to save your file as an Excel macro-enabled workbook. With the above methods, you can easily reverse the data order in a column or table. But what if you not only wish to flip values, but cell formats too? Additionally, what if some data in your table is formula-driven, and you want to prevent formulas from being broken when flipping cells in columns? In this case, you can use the Flip feature included with our Ultimate Suite for Excel. 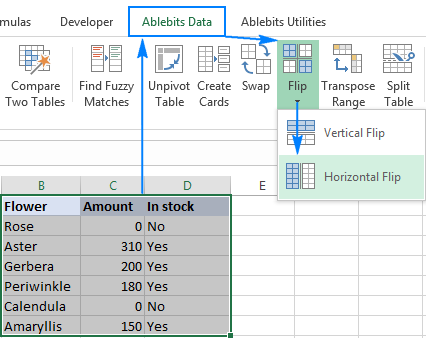 With any cell in your table selected, go to the Ablebits Data tab > Transform group, and click Flip > Vertical Flip. In the Select your range box, check the range reference and make sure the header row is not included. Select the Adjust cell references option and check the Preserve formatting box. Optionally, choose to Create a back up copy (selected by default). So far in this tutorial, we have flipped columns upside down. Now, let's look at how to reverse data order horizontally, i.e. flip a table from left to right. xTitleId = "Flip Data Horizontally"
Similarly to flipping columns, you can use our Ultimate Suite for Excel to reverse the order data in rows. 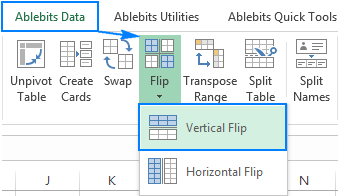 Just select a range of cells you want to flip, go to the Ablebits Data tab > Transform group, and click Flip > Horizontal Flip. Click the Flip button, and your table will be reversed from left to right in the blink of an eye. This is how you flip data in Excel. I thank you for reading and hope to see you on our blog next week! 5 Responses to "How to flip data in Excel: reverse columns vertically and rows horizontally"
Thank you so much. This is a life saver! I being searching for a solution like this nearly for an hour now. Thank you again! To flip horizontally, you can also simply transpose first, then sort A-Z (if necessary add column with numbers first to use to), then transpose back. Done. Thanks Roman, that was an extremely easy way to flip horizontally, took seconds.